Cows aren’t slaughtered to provide milk, so what’s inhumane about eating dairy products? Hens aren’t slaughtered in order to provide eggs, so what’s wrong with eating eggs – especially organic, cage-free, free-range, cruelty-free eggs? As a vegetarian, aren’t I already protected from heart attacks, cancer and other diseases – especially if I eat fat-free dairy and yolk-free egg products? Is it really true that raising cattle is terrible for our environment? I just don’t see how a little creamer in my coffee is contributing to global warming. How could I ever be vegan with my travel schedule/client dinners/social life/etc? It would be too hard. Even if I wanted to go vegan, how could I ever give up cheese???!!! If these questions have been going through your mind too, Vegetarian to Vegan was written just for you. 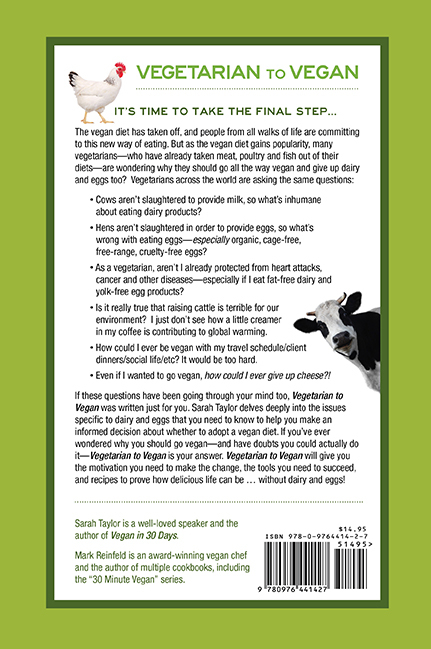 Sarah Taylor delves deeply into the issues specific to dairy and eggs that you need to know to help you make an informed decision about whether to go vegan. If you’ve ever wondered why you should go vegan – and have doubts you could actually do it – Vegetarian to Vegan is your answer. 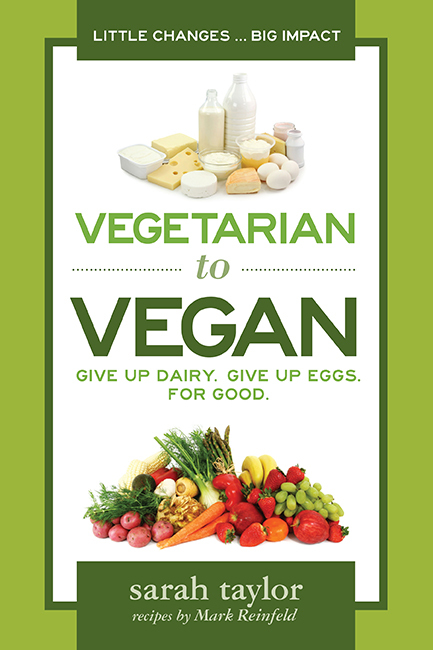 Vegetarian to Vegan will give you the motivation you need to make the change, the tools you need to succeed, and recipes to prove how delicious life can be … without dairy and eggs! Thank you so much for taking an interest in Vegetarian to Vegan. As a vegan for the past 12 years, I was always surprised at how little information was published on the specific reasons why a vegetarian might want to give up dairy and eggs and go fully vegan. So, I decided to write about it, thinking that it would have a strong niche in the vegetarian market, and make for an interesting book. What I wasn't prepared for, however, was that this book would change my life as it has. I researched late into the night for two years, studying for countless hours in hotel rooms while I traveled for my job, reading articles from medical journals and veterinary journals and, yes, the entire report from the United Nations on factory farmings' impact on our environment. I had this huge realization that even seasoned vegans probably have very little idea about the realities of egg-laying hens and dairy cows. Most of us know they are crammed into small living conditions that make them ill and disease-ridden and psychologically distressed, but I suspected that, like myself, others had no idea just how bad it was. When I gave my first lecture to other seasoned vegans on laying hens, discussing how and why they cannibalize each other at alarming rates … what "vent pecking" is and why it leads to cannibalism … what cage-layer osteoporosis is and why egg-laying hens get it but not broiler hens … well, I realized I was right -- this information has never been reported on in depth, all in one place. So, I finished this book two years after I started it, a very changed person. I have a strong knowing that my purpose is to relay this information to everyone who will hear it. I've dropped any concerns I once had about seeming radical for my views that are so far from mainstream. And more than ever, I know I'm on the right path. I hope you will be moved by this book and that it will transform your life as it has mine. Please send me your story - I would love to hear it! Copyright 2013 Vegetarian to Vegan. All rights reserved.